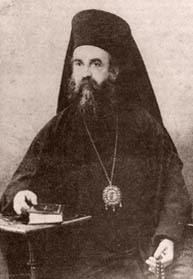 The following text comes from St. Nektarios' study on the human soul, and here he defends the dignity of man against naturalistic explanations for the origin of the soul of man. Whereas Darwinistic Evolution claims man, body and soul, was descended from lower life forms, Orthodox theology, as explained by St. Nektarios and other Church writers, teaches that man's soul has a divine origin, given by God. The rational soul of man is in God's image, and the purpose of man is to acquire the Holy Spirit and become like God. This ultimately distinguishes man from the animals. St. Nektarios astutely does not comment on the body of man, which he concedes is like that of an animal, as other Orthodox writers also say, because the body of man is part of the physical universe which science can study and learn about. For a short introduction to this text, read Introduction to Saint Nektarios' Study on Darwinism and the Human Soul. They who reduce man to the ranks of the irrational animals and who liken man’s soul to that of the animals deny the soul’s grandeur, the soul’s unique qualities and spiritual powers, and man’s sublime destiny. They are blind and unable to see the supremacy of the human soul, even though it is apparent through her works and clearly confirmed throughout the centuries. They close their ears to the voice trumpeted by the soul’s powerful achievements. Man’s soul is an exquisite entity that is adorned by divine virtues, which, in turn, sanctify his earthly domain. Man was truly created to sanctify the earth. Proponents of the theory that man evolved from apes are ignorant of man and his sublime destiny because they deny that man has a soul and refuse that he is capable of experiencing Divine revelation. They rejected the spirit, and the Spirit deserted them. They abandoned God, and God abandoned them. “Professing themselves to be wise, they became fools” (Rom. 1:22). “God gave them over to a reprobate mind to do those things which are not fit” (Rom. 1:28). A certain poet says very appropriately: “When the malicious demons want to harm someone, first they strip a person’s mind of sound reasoning and then persuade him to espouse a corrupt belief, so that man can no longer comprehend that he sins.” This is true because if people were aware of what they were saying, they would not debase themselves or pride themselves on being descendants of the genus of primitive animals. The prophet very fittingly said about them: “Man, being in honor, did not understand; he is compared to the mindless animals, and is become like unto them” (Ps. 48:20). They who have the audacity to group and compare the survival instincts of animals with the psychological qualities of man demonstrate that they are superficial and purblind because they perceive neither the restricted features of animals, nor the general, free, independent, and infinite character of man. It is impossible, right from the onset, to compare man to animals because there is an infinite chasm separating the two from each other. They who equate the traits of animals (when taken collectively) to the virtues and qualities of man, or the works and actions of animals to the works and accomplishments of the human intellect, and draw conclusions concerning their similarity err upon the very fundamental basis of the comparison; thus, their conclusions are incorrect. What type of comparison can be made between the works of animals and the technological advancements or the miracles of science attained by man? How greatly is poor man deceived as a result of superficial examination! What is there in common between the instincts and the never-changing capacities of animals and the scientific achievements of man? Man is extremely deceived, nearsighted, and blind! Why can he not discern and distinguish the difference between human beings and animals? How have educated people strayed away from true science to such an extent as to classify humans and animals together! How are they able to recognize the similarity that exists in their anatomical composition yet unable to perceive the difference that exists in their spirits? What is there in common between man and apes? If their similar physical appearance brings them together, their dissimilar spirit sets them apart to such an extent that the ability to compare the two vanishes. Was God perhaps obliged to create a different [anatomical] form for the embodiment of man, totally unlike any other found within the animal kingdom, prior to breathing His Divine breath into man, in order to render him an image of God? No, dear reader. God’s divine breath is so magnificent and noble that it was capable of rendering man an exceptional and preeminent being even by using an inferior template [for his body]. The harmony that exists between man’s body and his rational soul is so perfect that the careful observer will magnify in astonishment the extreme wisdom of the divine Creator, Who made all the bodily members compatible with and capable of fulfilling the demands of the soul. What purpose would man’s brilliant intellectual thoughts have if they could not be externalized through the body? What would be the purpose of man’s intellect, mind, spiritual powers, feelings, emotions, and the entire ensemble of spiritual qualities that distinguishes him from all the irrational animals, if man was just another animal? Man advances toward perfection daily. Man not only looks after himself, he is concerned for the well being of all of humanity in general, and he improves both himself as well as animals. Where do we see a trace of such preoccupation and improvement amongst the animals? Are not their accomplishments always the same? What comparison can be made between the shelter of monkeys that have remained unchanged for eons and the diverse range of buildings erected by man? What is there in common between man and monkeys, even if they have similar external characteristics? What if but monkeys can build huts, swallows can make nests, bees construct hives, and other animals have dens. What relationship is there between the chimpanzee that shatters nutshells with a stone and man who has devised an array of instruments to do the same? What is so remarkable if a monkey’s hand was designed in such a precise way (as was deemed necessary for its perpetuation), just as the elephant was given a dexterous trunk, and other animals analogous body parts according to their needs? What is so remarkable if God’s providence bestowed animals with adroitness, in order for them to preserve, sustain, and perpetuate themselves? Who can confirm that a monkey would have ever felt the need or thought of using a stone to help it consume its food if its hand was not constructed the way it is. Never will an animal benefit from the skillfulness and adroitness of another animal. A monkey can watch a beaver build a dam for centuries; however, it will never mimic the beaver’s accomplishment. Nor will a dog, or a bird, or any other animal (whether it be a simple organism or a highly-developed animal) mimic the skills of another animal. Which intellectual accomplishment of any animal documents their ability to contemplate, judge, and reason? Which animal ever turned an idea into knowledge? When did an animal ever have an opinion on a certain matter? When did any animal think about the origin of its existence, the end of its life, or concerning life and death? None of the admirers of monkeys and the theory that man evolved from apes can substantiate that any such thing has ever taken place with any animal throughout the centuries. Therefore, to support the opinion that animals and man have similar spirits that differ only in degree [of development] is completely incorrect and illogical. Man, this mysterious being, was created by God as the pinnacle of creation, in order for him to acquire knowledge of his Creator. In accordance to his great destiny, man was formed analogously. He received the honor of being fashioned in an entirely extraordinary and unique manner and was brought to life through God’s Divine breath. While all of creation was brought into existence from nothing by a single phrase—“let there be”—that externalized God’s volition, man alone had his body formed by the hands of the Divine Creator, only he received a living soul created through God’s inbreathing, and only he is made in the image and likeness of his Creator. What a marvelous creation indeed! What an honor for man! What a great destiny! Truly, his destiny is great, and his honor is sublime; however, more marvelous is the manner in which his body and soul were created. Because he became the image and likeness of God and was created in order to live eternally and dwell in the same place as the heavenly angels. How noble was man made! How much did sin debase and ignorance humble him! But this is not so! Man was endowed with nobility, and he will remain noble, even if certain people degrade themselves, even if certain people have forgotten about their sublime descent. Yes! Man is a supreme creation, and nothing can be compared to him. Source: From the book Sketch Concerning Man.